Thomas Grey, 1st Marquis of Dorset, was the eldest son of Elizabeth Woodville (pictured) and consequently a stepson of Edward IV of England. Thomas was Elizabeth's son by her first marriage, to Sir John Grey. He was created Marquis of Dorset on April 18, 1475 and summoned to Parliament on November 15, 1482. In January 1482-3 on the death of his grandmother Elizabeth, he became Lord Ferrers of Groby. He appears to have had some illustrious moments in his military career, including commanding the forces assisting the Emperor Maximilian against the French, and he was a Knight of the Garter. Less successfully, he joined the Duke of Buckingham's 1483 rebellion against Richard III. When the rebellion failed he fled to Brittany to join Henry Tudor, the future Henry VII. 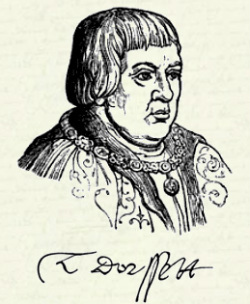 He inherited Weddington in 1491 from Reginald, Lord Grey. Thomas first married Anne of York, dowager Duchess of Exeter and sister of Edward IV. After she died without children he married Cecily Bonville, Baroness Harington and Bonville. By the latter marriage Lady Jane Grey was his great-grand-daughter. Upon his death he was buried at Astley, Warwick. He is further enshrined in history through being depicted in William Shakespeare's play Richard III.